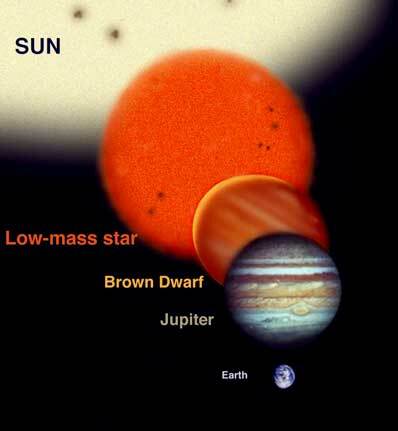 Brown dwarfs are the link between massive planets and small stars. They have an upper limit of about 80 Jupiter masses, but are not massive enough to sustain nuclear fusion in their core. They do however experience convection from the interior to the surface. The confusion arises when trying to find the lower limit of brown dwarf size, at what mass does the gas giant planet start being a brown dwarf star? This grey area is thought to be characterized by an entirely new stellar type: Y-class dwarfs. Until now Y-class dwarfs have been very elusive and have only existed in theory. Astronomers using near-infrared and infrared instruments at the Canada France Hawaii and Gemini North telescopes and the European Southern Observatory in Chile have discovered a Y-class dwarf, bringing this strange failed star from theory and into reality. What’s more, it’s in our cosmic neighbourhood, only 40 light-years from Earth. This brown dwarf has been unglamorously named “CFBDS0059”, but I would have called it something like “The Dark Star” or “The Death Star”, as it is so dim and its surface temperature is approximately the same as the surface temperature of the planet Mercury (but much cooler than the surface temperature of Venus). As it is so cool, it isn’t very luminescent and only radiates in the near-infrared wavelengths (it’s not even as hot as a standard electric stove element), requiring specialist equipment to detect it. As it turns out, CFBDS0059 is small, only 15-30 times the mass of Jupiter, fulfilling the lower mass limit of brown dwarf stars and will be known as the first Y-class dwarf to be observed. But what is the indicator that a Y-class brown dwarf has been observed? Using spectrometers, astronomers have been able to see the constituent compounds making up the brown dwarf’s atmosphere. Should ammonia be discovered, it’s a pretty sure sign that a Y-class dwarf has been found. “We are starting to see a little hint of ammonia absorption.” Loic Albert (stellar researcher) of the Canada France Hawaii Telescope in Hawaii, commenting on CFBDS0059. There are two other verified classes of dwarfs, L and T-class dwarfs. L-class dwarfs are hotter, with temperatures from 2200 to 3600°F and T-class dwarfs are cooler than 2190°F and methane-rich. CFBDS0059 is obviously much, much cooler, but researchers believe there may be still cooler dwarfs out there, possibly condensing any water vapour in their atmospheres to form clouds, setting Y-class dwarfs far from the characteristics of its L and T-class cousins. Should they get any colder, water will freeze into ice crystals, giving them more planetary than stellar characteristics. Do the know if its our Suns binary partner? Oops. I forgot that I read that. He threw me off when he said “Death Star”. Well lets hope so. The whole “Death Star” theory bothers me that we havent found it yet, if it even exsist at all. The last thing we need is a star that comes into the inner part of our solar system, starts knocking astroids around and throwing them every which way, and a giant one blasting in to the Earth. Hmm, 350 celcius sounds so low. So, humans could walk on this star with anti radiation suits and quite standard anti heat equipment… + a litle oxygen tank? I wouldn’t call this a star but a gas giant in it’s early stage? Quite apart from the object not having a defined surface (a little like a gas giant) if it did have its gravity would squash you flat in a moment! with or without your ‘little oxygen tank’! Since the ancestral time, world space research is progressing on wrong concept because we unknown about space mirror which is a great mystery and creator of lots of mysteries viz. milk ways, galaxies, nebulas, supernovas, white dwarfs, black holes etcs. Hence without study of space mirror the space research has no future. It can not explain in short. Therefore it invites to visit http://www.spacemirrormystery.com to know the logic and original truth. Giant telescope like Hubble and others may be the milestone of our technology but it can not help the real space research. A Space Mirror? I’ll grant it’s a pretty looking website, but the idea seems a bit, well, shall we say problemmatic? So if I understand your concept the earth is trapped between two mirrors, and everything we see in deep space is actually virtual depth created by reflections between the mirrors? Is this mirror a sphere? If so you have a bit of a reflection issue. If not your theory has some “gaps” in it. I wish you luck in your efforts to $10,000 to reveal the location of the “second earth”. Although 18 jupiter masses is still pretty large, I think there is even smaller waiting to be detected of the other classes. As far as an even cooler class dwarf, Im not sure what to make of that. Whether it is even possible for that matter. Do stars require a certain internal temperature in order to jump start fusion, or is it based on mass? Or is dwarf just a term for the failed star that is to big to be a planet? Reading that convections happen in the star, but doesn’t that happen in most gas giants? Welcome y class dwarfs . We can see only light and lighted objects. We can see nothing in the darkness. A thing may how much bigger if it go away to away from our eye views, the thing appears us smaller to smaller and at last it will disappear from our eye views. The sun is the only object who gives light the entire solar system. In size it is 3 lakhs time bigger than earth but we look it like a football size. From calculation we know that sun is about150 millions Kilometer away from the earth. So we can find earthlike object at same distance must be disappeared. Since we are created from earth, the eyes power of us has merged with the earth. Since the earthlike object disappears at distance of 150 million Kilometer, the eye powers see anything ahead of it, is zero. But cause reflection we find very deep space on the side of darken earth and find sun spots on sun. So “brown dwarf star” is nonsensical. Could brown dwarfs have inhabitants on them ? If it’s the largest cool brown dwarf star, then does that means that they will never find any one star out there as big or bigger than that one, ever? Oh and to add, clearly it can’t be the biggest, it is only the biggest we know about. Oh, one more thing, I do think that it’s a nice article as well. if large gas planet like jupiter has heat conviction, and unsustainable hydrogen/lithium fussion may also occure in their core, could we call them dwarf star too?